My daily dose of splashing in paint puddles. What could be better? I ask you. OK, chocolate. Maybe. Not much else! Happy Friday’s on its way Day! I wish you puddles of purply paint and big smiles today. Enjoy! Haha thanks! Yours is really amazing. It’s weird about the challenge you’re doing because I had just done this the night before?! Hehe. By the way, I heard your Mets rocked it with those pesky Blue Jays. Have they made a believer outta you yet? Yes and how about those O’s? They are really cooking. Well, I’m still holding my breath. But I’m starting to like Wilmer Flores. And d’Arnaud being back is a big lift. love that! “daily doses of splashing in paint puddles!” my happy place too! thanks for you daily inspiration! Love the Emerson quote too! Nothing! Not even chocolate. Love this one! This is one of my favorite quotes, it´s so simple and still so right! Love your wonderful colors!!! I think you are out there having fun. I’m trying to loooooosen up, loooooosen up. 💜 Thanks, Kirk. Maybe you need to add chocolate to your art somehow? 🙂 I enjoyed splashing in paint puddles with you! Happy Day Laura, thanks for your positive energy! Did you end up with purple toes after your puddle splashing. Lovely watercolor! Thanks C! It was fun to do. Crayons rock! I love the color palette, and composition. It’s so cheery! Thank you! It was a lot of fun! Glad you like it! 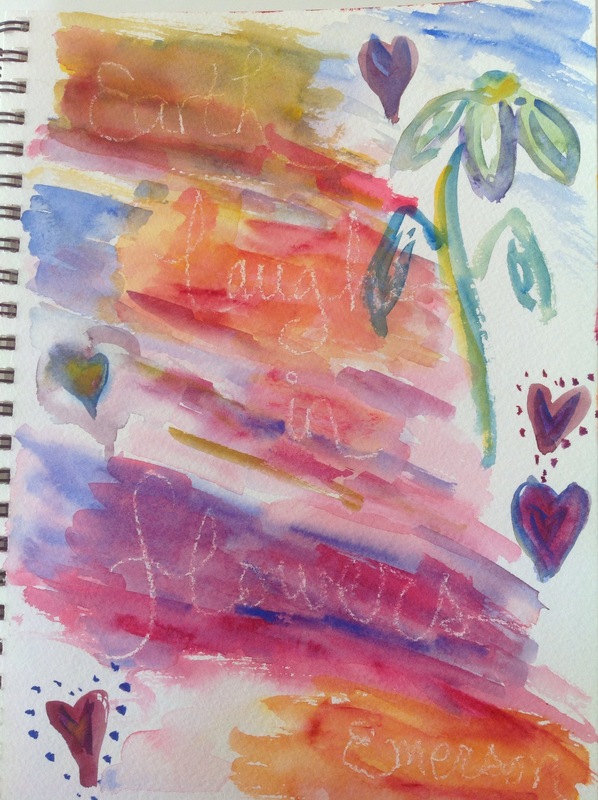 Paint, color, and text….love it. Thanks, Jo! I’m so glad you do.